The Coastal Biodiversity Survey is a large-scale research project conducted by a group from University of California Santa Cruz called the SWAT Team. 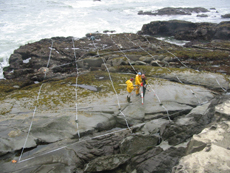 The Survey was designed to measure diversity and abundance of algal and invertebrate communities living on the rocky intertidal, western coast of temperate North America. The Coastal Biodiversity Survey is part of our larger intertidal monitoring program. Please visit pacificrockyintertidal.org for the latest information and updates. Determine the diversity and site-wide abundance of intertidal algae and invertebrate species. Create a topographic map for use in assessing the spatial distribution of species within each site. Reveal long-term influences such as climate change and coastal development on intertidal communities and individual species. Examine patterns of biogeography with a particular emphasis on locations where there may be large changes in species composition and diversity. All sites surveyed during the CBS have been sampled the same way, at the same level of effort, area of the shoreline and at the same level of taxonomic distinction. 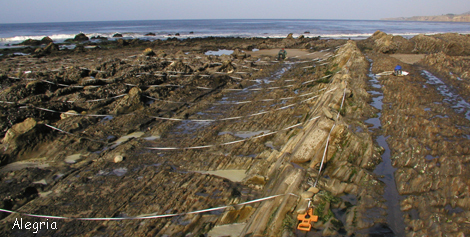 Any differences observed among sites represent true differences in the intertidal community, not differences in the sampling methods. The SWAT Team organizes and carries out these surveys and is regularly assisted by regional experts and volunteers. The CBS is supported by funding from Partnership for Interdisciplinary Studies of Coastal Oceans (PISCO). CBS also receives support from MARINe-MMS, Monterey Bay National Marine Sanctuary. National Park Service, The Nature Conservancy and UC Mexus. Increasing threats to the coastal environment due to human development, pollution and overharvesting has created a need for more information on the health of coastal habitats. Information gathered by the CBS is unprecedented in its scale and depth. It sets a baseline of knowledge about what is living on our fragile coast. From this we can better understand changes in our environment and the ways in which we can aggravate or alleviate these changes.